Our new Outlander and Game of Thrones tour is perfect for fans of the two most popular TV shows on screen this year . First of all we take a unique tour of three key locations in the life of Outlander’s Jamie Fraser – Lallybroch ( Midhope Castle ) , Jamie’s ancestral home , Linlithgow Palace ( Wentworth Prison ) and Blackness Castle ( Fort William ) . Then we visit Doune Castle , heavily featured in Game of Thrones , and also Castle Leoch In Outlander . Castle tours can be booked on 07305-294773, toll free number 1-866-233-2644 or online . Tours start at 10 am . Our private group tours take up to four people to three Jamie Fraser Outlander filming locations. We also offer bespoke private tours with the option of choosing your own itinerary . This tour costs £190. Tours start from your hotel or accommodation in Edinburgh or Glasgow . Other pickup points can be arranged . Itinerary 1 . Lallybroch – Midhope Castle The first location on this tour is Lallybroch – Midhope Castle, ancestral home of Jamie Fraser . Outlander scenes were shot at Midhope Castle on the fringes of the Hopetoun Estate near South Queensferry. Midhope was built in the 15th Century by John Martyne, laird of Medhope. It was rebuilt in the mid 1600s and remains much the same today. The interior of Midhope is inaccessible . Midhope Castle, a 16th-century tower house, is used as Lallybroch (also known as Broch Tuarach) in Outlander . Left to Jamie by his parents, Brian and Ellen, Lallybroch is also home to Jamie’s sister, Jenny, her husband Ian Murray and their children. Lallybroch is a crucial part of Jamie Fraser’s life in Outlander . Outlander & Game of Thrones tours can be booked on 07305-294773 or toll free number 1-866-233-2644 or online . 2 . Blackness Castle Blackness Castle goes back to 1440 . The castle provides the setting for Fort William, as the original fort no longer exists. The castle is long and narrow because of the shape of the rock on which it is situated and it is sometimes called ‘ the ship that never sailed ‘ . It guards the bay at Blackness and is only a few miles from Linlithgow Palace . The first castle was built in the middle of the 15th century by Sir George Crichton , Earl of Caithness , a member of one of the most powerful families in Scotland . Jamie Fraser Outlander tours can be booked on 07305-294773 , toll free number 1-866-233-2644 or online . 3 . Linlithgow Palace This royal palace is where Jamie Fraser was imprisoned and it featured some of the most harrowing scenes of the TV show Outlander . The Palace is also famous as the birthplace of Mary Queen of Scots . Doune is one of the best preserved medieval castles in Scotland. The Game of Thrones castle private tour starts at 10 am and it includes a transfer from Edinburgh to Doune , a driver/guide , a stay of about an hour at the castle plus a return to Edinburgh . Your guide will give details of the history of the castle , information about the Game of Thrones filming plus all the other films made at Doune Castle including Monty Python and the Holy Grail . Behind the scenes access Visitors to the castle can get details about Game of Thrones filming in the Great Hall and courtyard of the castle . Insider access Take the audio tour of the castle narrated by Monty Python’s Terry Jones and Outlander’s Jamie Fraser ( Sam Heughan ) . Game of Thrones t-shirts The castle was used as the set for Winterfell in the TV series Game of Thrones (2011–present), an adaptation of the A Song of Ice and Fire series of novels by George R. R. Martin. The castle was also used as “Castle Leoch” in the TV adaption of the Outlander series of novels. The Great Hall is 20 metres by 8 metres , and 12 metres high to its timber roof, again a 19th-century replacement.The hall has no fireplace, and was presumably heated by a central fire, and ventilated by means of a louvre like the one in the modern roof. No details of the original roof construction are known, however, and the restoration is conjectural.Large windows light the hall, and stairs lead down to the three cellars on ground level. The hall is accessed from the courtyard via a stair up to a triangular lobby, which in turn links the hall and kitchens by means of two large serving hatches with elliptical arches, unusual for this period. The kitchen tower, virtually a tower house in its own right, is 17 metres (56 ft) by 8 metres (26 ft). The vaulted kitchen is on the hall level, above a cellar. One of the best-appointed castle kitchens in Scotland of its date, it has an oven and a 5.5-metre (18 ft) wide fireplace. A stair turret, added in 1581 and possibly replacing a timber stair, leads up from the lobby to two storeys of guest rooms. These include the “Royal Apartments”, a suite of two bedrooms plus an audience chamber, suitable for royal visitors. …and standing with her hands behind her back in…the Winterfell library? Business Sansa. I like the corset. HBO’s worldwide “Game of Thrones” scavenger hunt ended Thursday when a Queens resident found the last of six iron thrones in Fort Totten Park. Game of Thrones tours from Private tours Edinburgh. Phone 07305-294773 for more details . HBO crowned Queens resident Melanie Joaquín the “Queen of Queens” on Thursday, when she figured out the location of the last iron throne in a worldwide scavenger hunt. Joaquín told HBO she instantly knew Fort Totten Park was the answer when the network posted a cryptic clue hinting at the throne’s location, according to Gothamist. The network chose Fort Totten Park “because of its dark and ominous setting, reminiscent of the basement of Kings Landing, where the Mad King stored his destructive wildfire, and where Queen Cersei waged to destroy the Great Sept of Baelor,” according to Gothamist. “Game of Thrones” fans can see the Throne of the Crypt in Fort Totten Park through April 1, from 7 a.m. to 7 p.m.
Heritage bosses hope the popularity of Game of Thrones will inspire more people to visit Hadrian’s Wall. Game of Thrones tours from Private tours Edinburgh. Phone 07305-294773 for details. They say since the popular TV show started in 2011 visitors have asked about similarities between its giant ice wall and the Roman Wall. Author George RR Martin has said he came up with his creation while visiting Hadrian’s Wall. Watchers on the Wall will be stationed along the wall to answer questions about it and Game of Thrones. The watchers, who are all Game of Thrones fans and English Heritage staff, will wear black cloaks and carry shields, with the designs based on the four main houses in the TV show. 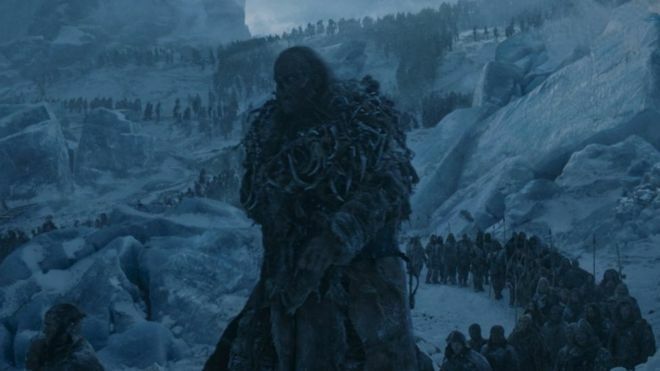 They are a reference to the Night’s Watch guardsmen – a military order which guards the wall, which stretches 100 leagues (300 miles) along the northern border of seven kingdoms and is made of solid ice. English Heritage said other similarities were the oath taken by the Night’s Watch, forbidding them to marry or to father children, similar to what was originally expected of the Roman soldiers. Game of Thrones is HBO’s most popular ever TV series. It has won multiple Emmy awards and drawn tens of millions of viewers worldwide. The show is based on George RR Martin’s A Song of Fire and Ice novels. Fans of his books been waiting for about eight years for The Winds of Winter, the sixth book in the epic series that began with A Game of Thrones in 1996. A trailer for season eight was released in January, the first glimpse of new material since 2017. Hadrian’s Wall was built to guard the north-west frontier of the Roman Empire and runs 73 miles (117km) between Wallsend in North Tyneside and Bowness on Solway in Cumbria. The watchers will be able to answer questions about Hadrian’s Wall and also about Game of Thrones, particularly how the Roman Wall inspired Martin’s books. 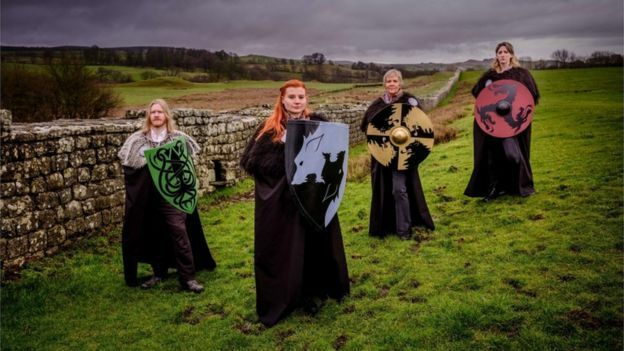 The watchers will be at Birdoswald Roman Fort, in Cumbria, and Corbridge Roman Town, Housesteads Roman Fort and Chesters Roman Fort, all in Northumberland, from this week until the final series, which starts in April, and ends later this year. Millions of fans are desperate to discover who will finally sit on the Iron Throne, and rule the fantasy land of Westeros. A twenty-five million pound campaign to help pay for a radical overhaul of part of Princes Street Gardens has been launched with the support of Game of Thrones star Iain Glen. The Edinburgh-born actor has recorded a voice-over for an animated film which has been unveiled to coincide with the kick-starting of at least three years of fundraising. The Quaich Project. The Quaich Project, as the revamp will be known from today, will create a new arena for open-air concerts and events in West Princes Street Gardens, replacing the existing Ross Bandstand at the heart of “a landmark space that makes a clear statement as a welcoming, diverse, historic and forward-thinking destination”. Named after Scotland’s traditional cup of friendship, the new identity is said to have been inspired by the bowl-shaped topography of the gardens, which host the fireworks finale of the Edinburgh International Festival and the centrepiece concert of the city’s Hogmanay celebrations. The Ross Development Trust, which was created by former Edinburgh Playhouse owner Norman Springford after he offered to help pay for a new venue, said the planned overhaul would make the gardens “truly world class”. Mr Springford, who has offered to pay £5 million towards the cost of The Quaich, declared: “Our ambition is to create a space that says something about us as a nation – a place we can all be proud of.” As it will look after the transformation The trust, which says it wants to “bring people together in new ways to celebrate one of Scotland’s finest green spaces,” hopes there will be a hike in the number of people using the gardens, by opening up the area currently occupied by the bandstand for daily use, as well as overhauling the wider landscape. The campaign and brand have been developed by The Edinburgh-based advertising and design agency The Lane, whose previous clients include Edinburgh Airport, ferry company Caledonian MacBrayne, biscuit manufacturer Border and Scottish dairy firm Graham’s. Winter is here, and so is a special type of Scotch to warm your bones. In November, the popular Johnnie Walker whisky brand announced its release of a limited edition, Game of Thrones-themed beverage. The Scotch – named “White Walker” after the supernatural foes in the HBO fantasy series – is made of a blend of single malts from the Cardhu and Clynelish distilleries. Doune castle is Castle leoch in Outlander , home of Colum Mackenzie’s clan. Most of the filming of Outlander takes place in Scotland, according to the show’s executive producer Ron Moore . Appropriately, both distilleries are situated in northern Scotland, known for its harsh winters. The Scotch is meant to honour Game of Thrones’ final season, expected to air in early 2019. For the latest offers and best prices or to check availability phone or text us now on +44-7305-294773 or contact us online . Highlands tours - visit Glencoe, Buachaille Etive Mor, Loch Lubnaig and Loch Lubhair The Outlaw King tours - visit the main locations for the Netflix film starring Chris Pine. For the latest offers and best prices or to check availability phone us now on 07305-294773 (UK) , toll free number 1-866-233-2644 or contact us online . Outlander t-shirts Outlander gifts Edinburgh Castle t-shirts Our Tripadvisor tours page shows a selection of our latest tours . Is Black Jack Randall the perfect villain ?